The Nkana copper-cobalt operations, comprising four open pit and four underground mines, the North Mindola, Mindola, Nkana Central and Nkana SOB (Southern Ore Body). These mines exploit mineralisation, more or less continuously over a strike length of 14 km on the SW margin of the Kafue Anticline, immediately to the east of the town of Kitwe. The Mindola deposits form the northern section of the operation (#Location: Nkana - 12° 47' 46"S, 28° 10' 54"E; Mindola - 12° 46' 32"S, 28° 9' 48"E; SOB - 12° 50' 11"; 28° 11' 56'E). Indications of copper mineralisation in the form of a single small outcrop of copper stained black shale over the Nkana South Ore Body, were first brought to the attention of European explorers and prospectors in 1899. Subsequently two areas of claims were pegged in 1916, one over the outcrop and the other covering small 'ancient' workings, which were initially explored by trenching. Between 1918 and 1922 a 30 m shaft was sunk, and a crosscut encountered 20 m @ 3.4% Cu. Further shaft sinking and prospecting was carried out until 1927 when Anglo American began a systematic exploration program. Mining operations commenced in 1927 and by 1932 large scale production had commenced, which has continued to the present, with a number of major ownership changes. For details of the regional setting of Nkana and Mindola, the Chambishi-Nkana basin, the Central African/Zambian Copper Belt and the Lufilian Arc, see the separate Zambian Copperbelt record. The Nkana operation deposits are hosted by the Neoproterozoic Lower Roan Subgroup Copperbelt Orebody Member of the Katanga Supergroup, within the Chambishi-Nkana structural basin, located on the mid-southwestern flank of the 'Kafue Anticline'. The 'Kafue Anticline' is a late-tectonic structural feature within the Domes Region of the Lufilian Arc, centred on a basement high of Palaeo- and Mesoproterozoic gneisses and schists, over which the Katangan sedimentary rocks were draped. The Chambishi-Nkana basin is essentially a NW-SE elongated, doubly plunging, structural basin, predominantly surrounded by pre-Katangan basement. The basinal structure cuts across the generally NW-SE trending facies boundaries within the Lower Roan Subgroup. The Nkana-Mindola mining area lies largely on the eastern limb of the NW-plunging Nkana syncline, which forms a SE prolongation of the Chambishi-Nkana structural basin. Basal Conglomerate, 0 to 24 m thick - varies from a well rounded pebble conglomerate to a boulder bed while elsewhere it is an angular scree deposit. It comprises clasts of granite, gneiss and quartzite in a sandy matrix. In places it grades down into a sheared matrix with distorted granitic and quartz boulders. This member is variably developed, infilling the valleys and mantling the lower slopes of basement hills. Footwall/Basal Quartzite, 0 to 150 m thick - is more widespread than the underlying conglomerate. It is generally either absent, or greatly reduced over basement hills but reaches its maximum thickness over the intervening valleys. It commences as thin gritty and pebbly beds up to 6m thick above the Basal Conglomerate or basement and is overlain by light grey, glassy, slightly feldspathic quartzite with high angle, large scale crossbeds interpreted as being of aeolian origin. A 2 m chaotic breccia layer occurs near the middle with ill sorted angular basement clasts in a dark ,muddy, gritty matrix. Locally a black, flinty, fine grained quartzite with thin, impersistent, pink, quartzo-feldspathic layers is developed near the base of the unit. Footwall Transition, or Basal Sandstone Unit, 20 m thick - variable proportions of rapidly alternating feldspathic quartzite, argillaceous quartzite, feldspathic grit and pebble conglomerate. At the top, immediately below the basal conglomerate of the overlying unit, these fine grained beds are overlain by increasingly coarser ones, and interstitial anhydrite, which may be leached out locally, is abundant in places. This unit is absent over the more extreme basement hills. Lower Conglomerate, 10 to 14 m thick - poorly sorted, polymictic conglomerate, with rounded to sub-rounded pebble to cobble sized clasts of granite gneiss, schist, quartzite, vein quartz and feldspar set in a medium to coarse grained arkosic to argillaceous or micaceous matrix. It is thickest on the flanks of the palaeohills but pinches out against these basement highs and lenses out over the intervening lows. This conglomerate contained abundant anhydrite, now largely dissolved. Footwall Sandstone Unit, 15 to 20 m thick - the lower sections of this unit consists of a fairly rapidly changing sequence of almost black fine grained quartzite and argillite, with lenticular interbeds of feldspathic quartzite and grit displaying festoon crossbedding and washout features. Anhydrite is common in the lower sections, especially where it overlies the basement complex directly. There is a transition into the upper pink, fairly massive, arkose, with gritty bands and some pink and white feldspar pebbles with crossbedded heavy mineral layers in places. At one locality a seam up to 3 m thick of anhydrite is found at the base of the unit with randomly oriented schist fragments from the immediately underlying basement. On the fringes of the Kitwe Barren Gap the Footwall Sandstone grades laterally into massive to schistose to white pure to tremolitic or talcose dolostone, with thin pale grey dolomitic argillite interbands. Footwall Conglomerate, 1 to 4 m thick - is generally 1m thick, but locally below barren shale it reaches 4m. It is very rarely present in the SOB, impersistent at the Central Shaft and is usually present at Mindola Shaft, although it is missing to the north of Mindola. It varies from a pebble conglomerate to a cross bedded fine pebbly grit and is polymictic, though schist, vein quartz and feldspar predominate. The conglomerate tends to be coarser and more ill sorted at Central Shaft than at Mindola, while the matrix is predominantly arenaceous at Central Shaft but kaolinitic and argillaceous at Mindola. The lower contact is gradational, while the upper is sharp and probably represents a break in sedimentation. It is generally barren, but the upper 20 cm, where it is less pebbly and more 'muddy', may be mineralised. In some of the literature (such as Garlick in Fleischer, Garlick and Haldane 1976), this unit is included in the Copperbelt Orebody Member of the overlying Kitwe Formation, as it is mineralised. Schistose Ore, 2 m thick - which forms the sheared contact with the underlying Footwall Conglomerate, and occurs as a micaceous, thinly foliated (finely banded) white dolostone and schistose dolomitic argillites, locally carrying blebs of dolomite and anhydrite, with variable bornite-chalcopyrite mineralisation. This unit forms the base of the Copperbelt Orebody Member, and generally carries higher grades than the overlying Low Grade Argillite. Low Grade Argillite, 2 m thick - dark massive grey dolomitic mudstone, with patches and veins of purer dolomite, and fine disseminations and elongate thin lenses of bornite and chalcopyrite. The unit generally carries <1% Cu. Banded Ore, 2 to 4 m thick - alternating thin interbeds of white dolomite and sheared grey argillite which locally exhibit small scale slumping, load casting and washouts. Individual interbeds may be regular to ragged and 1 to 100 mm thick. Sulphides follow the banding as crowded disseminations and as lensoid bands of solid bornite and/or chalcopyrite up to 1 mm thick but only 5 mm to 10 cm long. The sulphide bands are also present as crosscutting branching veinlets. The banding appears to be in part tectonic. The unit becomes more siliceous towards the top. Cherty Ore, 1 to 4 m thick - a tough, massive, non-schistose grey argillite with sparse white dolomite laminae near the base. Dolomite spots and shrinkage cracks are evident near the top. Thin carbonate veinlets and fracture fill cut the rock, with disseminations, blebs and veins in several directions of bornite and chalcopyrite. No. 1 Marker, 0.5 m thick - a strongly schistose/laminated dolostone containing argillite lenses and boudins, with disseminations and veinlets of bornite and chalcopyrite. It is locally rich in anhydrite, and laterally grades into a bedded anhydrite-dolomite rock. This marker can be traced through much of the Mindola and Central Shaft areas, although it does not extend as far north as the Mindola Open Pit. Porous Sandstone, 0 to 4 m thick - varies from a massive khaki siliceous dolostone through a dolomite-anhydrite rock to a massive algal dolostone with stromatolites. The stromatolites are best developed to the north of Mindola. Desiccation cracks and anhydrite are common throughout the unit. Bornite and chalcopyrite are present as fine disseminations and thin veinlets following the banding. Its name derives from the outcrop expression where the carbonates have been leached leaving a porous, poorly consolidated sandstone. It is locally absent from the sequence. Mineralised Argillite, 0 to 2 m thick - massive argillite with local dolomite streaks and nodules from a few mm across to 5 x 10 mm, with cores of bornite. Locally it is a grey cherty argillite with white dolostone and schistose dolostone bands. It is also often absent. Hangingwall Argillite, 5 to 10 m thick - This is seldom mineralised and marks the top of the Copperbelt Orebody Member. It comprises a grey dolomitic argillite or siltstone, locally rich in dolomite spots and anhydrite blebs which coarsen upwards towards the overlying Hangingwall Quartzite. Contact Shale Member, 0 to 4 m thick - contorted laminated dolostones and argillites or massive dolostone locally rich in tremolite. This may be the equivalent of the Mindola Schistose Ore, or perhaps a condensed unit representing the whole of the Mindola Succession. Orebody Member, 5 to 20 m thick - comprising a lower black carbonaceous shale with sulphide rich bands, laminae and veinlets of white dolomite. There is a gradual decrease upwards of the dolostone component until the upper division becomes a massive black carbonaceous mudstone, usually rich in pyrite. The gradational and indistinct contact with the overlying Hangingwall Argillite is marked by a change in colour from black to light grey. Hangingwall Argillite, 5 to 10 m thick - as for the Mindola Succession. * Western Limb Succession - on the western limb of the Nkana Syncline, opposite Nkana Central and the SOB, the Copperbelt Orebody Member is a banded sericitic argillite and carbonaceous shale. Hangingwall Quartzite, 0 to 5 m thick - varies in composition from a massive to laminated medium grained pure quartzite to an interbanded and cross bedded sequence of arkose, greywacke and anhydrite rich dolomitic sandstone, to a pink and white dolostone. The upper and lower contacts are gradational. Near Water Sediments Member, 20 to 25 m thick - colour laminated greenish to purplish argillite and dolomitic argillite with lenses, stringers and interbands, from 1 to 3 m thick, of buff feldspathic grit, carbonate cemented sandstone, dolomite and anhydrite. At Mindola and the Central Shaft, a single 1 to 3 m thick, well banded, cherty quartzite is recognised as a separate unit, the Middle Quartzite. Leaching of the carbonates, anhydrite and kaolinised feldspars gives the rock a pitted and fissured appearance and makes it a strong aquifer. Upper Quartzite Member, 10 to 15 m thick - commences with a 1 m thick massive pink to micaceous dolostone band with cherty nodules. The remainder is an off-white to grey and brown mottled, medium grained to gritty feldspathic quartzite with interbands of black siliceous argillite and dark grey, somewhat gritty quartzite containing finely laminated de-silicified chert bands and sparsely disseminated well formed mega-crysts of pyrite and chalcopyrite. Dolostone-Argillite Sequence, 20 to 30 m thick - which has a transitional contact with the underlying Upper Quartzite Member, comprising a distinctive, striped, thinly interlaminated, white dolostone and black argillite rock. Passing upwards the dolostone bands become progressively thicker, with at the top, bands up to 3 m thick of pink dolostone with thin argillites interbands. It has a saccharoidal to mega-blastic texture due to dissolution and is locally very permeable. On the western limb of the Nkana Syncline, the Kitwe Formation is composed of argillites, quartzites and dolostones. The Kitwe Formation is progressively overlain by the Upper Roan carbonates, the carbonaceous argillites of the Mwashya Subgroup and the diamictite, limestones and argillites of the Nguba Group. The predominant mega-structure of the Nkana Mining Area is the NNW-SSE trending Nkana Syncline. This structure is asymmetric, with a curved axial plane inclined steeply to the northeast in the Lower Roan Copperbelt Orebody Member trough of the syncline, but upright to westward dipping at higher levels. A complex set of en echelon parasitic drag folds with undulating plunges occupy the axial zone of the syncline, but dies out on the eastern flank, with relatively constantly dipping limbs up dip from the hinge. Two main décollement surfaces are evident in the Nkana Mining Area, namely the Basement to Lower Roan Subgroup contact and at the base of the Lower Roan Subgroup Copperbelt Orebody Member, specifically within the Schistose Ore unit. Both are a reflection of competence differences. In the latter case the change from predominantly arenitic Mindola Clastics Formation to the argillaceous to carbonatic Copperbelt Orebody Member marks a major competence change. However due to the angular unconformity, the variations between the Basement and the Lower Roan conglomerates/arkoses varies. In places the Basement comprises schists of the Lufubu, while in others the Basement is a competent granite. The granites also usually constitute the underlying basement highs which protrude into the Katangan and complicate the subsequent structure (ZCCM 1990). The parasitic drag folds appear to die out as the lower décollement with the Basement is approached (after Garlick in Fleischer, Garlick and Haldane 1976), with the drag fold axes plunging towards the décollement surface. Within the axial zone of the Nkana Syncline shear folding is characteristic, with transposed bedding, attenuated to sheared out fold limbs, with axial swelling and chevron folds being developed. The structures indicate thrusting directed towards the NE, within the two décollement surfaces outlined above. In addition the Basement Complex adjacent to the Lower Roan Subgroup cover has been sheared, with refoliation developed parallel to the axial planes of the folds in the Katanga cover rocks. Late stage shearing of basement highs and anticlinal crests has produced structures, where a thin screen of Lufubu schists (an original basement ridge) has been injected into the Lower Roan sediments (ZCCM 1990). Faulting is rare and only causes displacement of a few to 10 m or so. In some cases it appears to be related to compensation for competency relationships influenced by basement highs and other irregularities. The dip of eastern limb of the Nkana Syncline varies from north to south. At Mindola North, the orebody dips at ~30°W, increasing to 45° at depth. Further south, towards Mindola it steepens at shallow levels to be vertical to overturned at 75°E by the barren gap. At the Central shaft, the NE flank of the syncline contains three major asymmetric folds, the axial zones of which plunge at 20 to 45° to the NW, separated by shear-anticlines, with axial planes steeply inclined to the SW, to overturned at depth. Typically these folds have short NE-facing and long SW-facing limbs, indicating shearing stress directed to the NE. 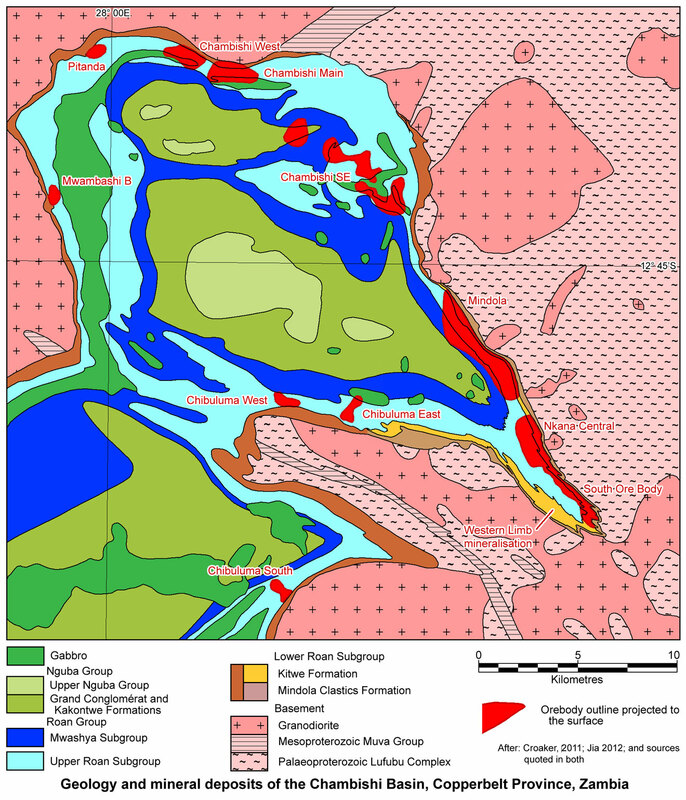 The South Orebody (SOB) zone is developed close to the axial zone of the Nkana Syncline, where six major, complex, tightly compressed, en echelon folds are developed with plunges that undulate erratically. These folds have attenuated limbs and well developed bedding plane crumpling, axial plane cleavage and shearing, particularly where competency contrasts are juxtaposed. Plunges markedly flatten in barren gaps, which are associated with basement highs, and steepen on the flanks of the gaps. The western limb, adjacent to the main synclinal axis, has a similar structure to the SOB zone on the facing eastern limb. One of the main structures on this limb is the Luanshimba Anticline, with a shallow, undulating plunge and limbs deformed by a complex of en echelon shear folds with curved axial planes (Wimberley et al., 2011, after "Geological guide to Nkana, Mopani Copper Mines Ltd"). The sequence has been metamorphosed to greenschist facies, with diagnostic metamorphic minerals biotite, chlorite, tremolite, talc, sericite and albite. Metamorphism varies from the quartz-albite-epidote-biotite sub-facies in more highly deformed areas to quartz-albite-muscovite-chlorite facies elsewhere. Ore is distributed over a strike length of ~14 km in the Nkana-Mindola area, of which 1.5k m is taken up by the Kitwe Barren Gap. Mineralisation is also developed over ~6 km of the western limb of the syncline and in the Mindola Clastics Formation at Chibuluma. There are two stratigraphic positions within the Nkana Mining Area in which ore is found. The most important is within the Copperbelt Orebody Member. The second and less significant, is the Footwall Ore Body position in the SOB Mine at Nkana, (repeated at Chibuluma, 10 km to the west), hosted by the Footwall Quartzite and Footwall Transition/Basal Sandstone, immediately below the Lower Conglomerate. This interval and the overlying basal Footwall Sandstone are characterised by strong interstitial anhydrite. Copperbelt Orebody Member - orebodies are distributed throughout the Copperbelt Orebody Member. Overall, the best grades of primary mineralisation (~4% Cu) are found to the NE, dropping off to nearer 2.2% Cu at depth to the south. To the SW, Garlick in Fleischer, Garlick and Haldane (1976), and others, recognise a limit to ore, where the Copperbelt Orebody Member passes into black carbonaceous shale, with only low grade chalcopyrite, carrollite and pyrite, then to pyrite with scattered chalcopyrite. This gradation from the normal Copperbelt Orebody Member to carbonaceous argillite is reflected in the change from the Mindola to SOB successions, and also corresponds to the change from bornite-chalcopyrite to chalcopyrite zones, which parallels the bornite to bornite-chalcopyrite transition further up dip and to the north. Down dip in the SOB Mine this chalcopyrite zone apparently changes to the chalcopyrite-pyrite zone. To the west, the mineralisation on the Western Limb is characterised by its patchy nature, and the Copperbelt Orebody Member is composed of banded sericitic argillite and carbonaceous shale. Within the primary mineralisation the main ore minerals are bornite and chalcopyrite, with lesser chalcocite. The sulphide minerals are zoned both stratigraphically and laterally within the Copperbelt Orebody Member. 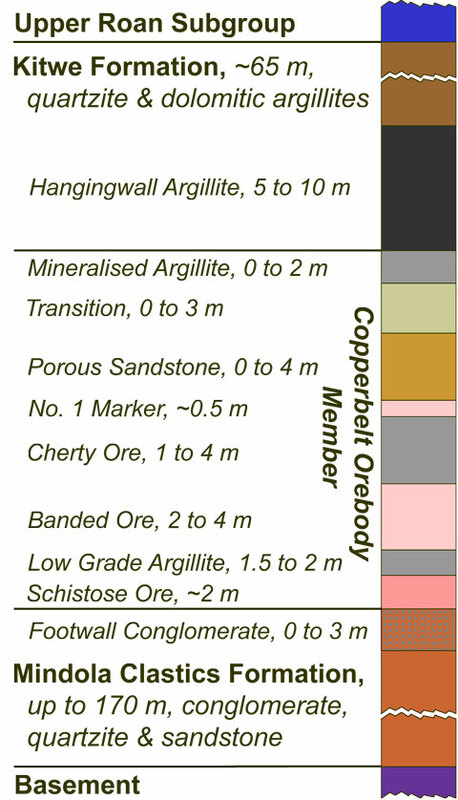 In the Mindola Succession, typically the Schistose Ore and the Low Grade Argillite (the two lowest Copperbelt Orebody Member units) carry low grade bornite and chalcopyrite mineralisation, while the Banded Ore and Cherty Ore contain similar mineralisation at a higher concentration and hence grade. Higher in the sequence chalcopyrite increases until it is dominant. While chalcopyrite may accompany bornite at the base of the orebody, bornite very seldom occurs with chalcopyrite and pyrite at the top. 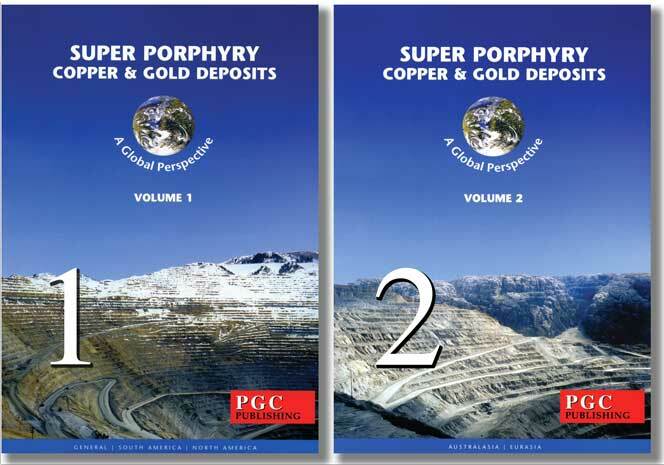 The next higher units, the Number 1 Marker, Porous Sandstone and Mineralised Argillite contain almost exclusively chalcopyrite with minor pyrite. The 1% Cu hanging wall usually occurs at the contact between the Mineralised Argillite and the Hangingwall Argillite. Above this pyrite is the dominant sulphide. Significant amounts of carrollite are normally confine to the Cherty Ore, Number 1 Marker and Porous Sandstone in areas of high Cu/Co values, generally in the bottom half of the orebody. In areas of low Co values, the Co is present as cobaltiferous pyrite at the top of the Copperbelt Orebody Member on either side of the 1% Cu assay hanging wall. The South Ore Body is characterised by chalcopyrite mineralisation in the Contact Shale and Cu rich sections of the South Orebody Shale. Pyrite increases at the expense of chalcopyrite in the upper parts of the South Orebody Shale, and a zone of exclusively pyrite is found at the top of that member. Bornite is characteristically absent in the South Ore Body, although minor occurrences fringe local barren gaps, particularly in the Contact Shale. In order of decreasing importance, chalcopyrite, chalcocite and bornite are present in the mineralised Footwall at the SOB. Higher Co values are concentrated on either side of the geological footwall, in the lower part of the Contact Shale and at the top of the Mindola Clastics Formation, especially on the south side of the Central Shaft area. In the structurally simpler Mindola Mine the sulphide minerals typically occur as fine disseminations, commonly aggregated into clots and blebs in the richer units. In the structurally complex areas of Nkana Central and South Ore Body the minerals occur predominantly in the dolomite bands of the Contact Shale and the South Orebody Shale as large streaks, lenses and cross cutting veins. Enrichment at the crests and troughs of folds is common. As such a significant proportion of the mineralisation within the drag folds appears as transgressive to concordant cleavage controlled veining, in contrast to the disseminations of the regular limbs. Garlick (1972) calculated the amount of Cu within selected drag folds and within equal volumes of the adjacent limbs to indicate that such veining were a result of remobilisation rather than primary emplacement. Migration of mineralisation into the Footwall Quartzites is not uncommon, especially at the South Ore Body Shaft. i). Arenaceous facies when the Copperbelt Orebody Member argillites and interbedded dolostones lap directly onto basement hills with no intervening Mindola Clastics Formation. The main example of this type is in the northern section of the Mindola Mine where ore is limited up dip by such a facies change, probably representing the shoreline onlap of the Copperbelt Orebody Member with the main Kafue Anticline and the eastward margin of the orebodies. ii). Normally bedded dolomitic facies, which are deposited over basement ridges. The best example is the Kitwe Barren Gap which is 600 to 1000 m wide, separating the Mindola and the Nkana Central ore bodies. As the Kitwe Barren Gap is approached from the north the Copperbelt Orebody Member thins as it interfingers with the carbonates, from for example a normal 25 m with 12 to 13m of ore; then 600 m further to 12 to 15 m of Copperbelt Orebody Member with 4 m of ore; then a further 90 m to 12 m of Copperbelt Orebody Member with 3 m of ore; until the standard Copperbelt Orebody Member lithologies have been replaced by carbonate with only weak (<1% Cu) mineralisation. The final margin of the barren gap when reached is near vertical and relatively sharp. On the southern margin of the barren gap, the Copperbelt Orebody Member increases in thickness from zero to the usual thickness over a similar interval. Towards the barren gap, from both directions, the Copperbelt Orebody Member becomes more schistose with associated tremolite, particularly on the footwall contact. iii). Stromatolitic/algal biohermal reefs, developed over highs in the basement. This style is evident in the southern section of the South Ore Body, forming the dolomitic footwall. From the literature it is difficult to discern the difference between the last two types, particularly as the Kitwe Barren Gap is commonly described as a biohermal reef. To the north the Mindola mineralisation thins from 11 to 12 m thick gradually until it becomes too thin to be economic. This lensing out is known as the Ichimpe Barren Gap. On this northern limit, the Mindola Orebody changes from an overturned NE dip to the south near the Kitwe Barren Gap, to a shallow dip of 30 to 40°SW near its northern pinch-out. This margin plunges steeply to the south. There is an ~20 km gap between Mindola and the next major mine at Chambishi, although significant mineralisation is still present at intervals. In the middle of the gap, some 10 km from Mindola, the Chambishi Southeast reserve has been outlined, comprising 105 Mt @ 2.04% Cu (made up of 55 Mt @ 2.4% Cu, 50 Mt @ 1.6% Cu). 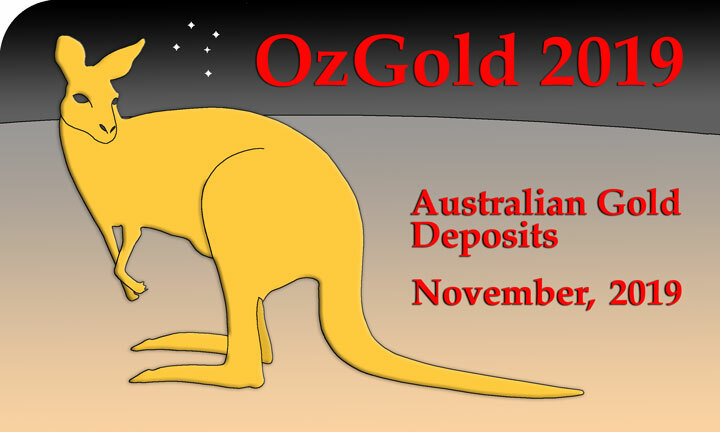 The deposit is flat lying and completely blind, located on the flanks of a palaeo-hill over which the Copperbelt Orebody Member becomes dolomitic. The Mindola Clastics Formation again comprises quartzites, grits and conglomerates. The Copperbelt Orebody Member consists of interbedded dolomitic shale/siltstones and argillites with organic carbon. The mineralisation occurs as fine sulphide disseminations or concentrations along bedding planes, composed of chalcopyrite with minor amounts of carrollite, cobaltiferous pentlandite, and bornite/linnaeite in certain areas. The two grade blocks listed above contain 16 Mt @ 0.15% Co and 26 Mt @ 0.1% Co respectively, with the Co mineralisation being on the flanks of the old basement ridges. The ore occurs as an 8 km by 1 to 2 km NW-SE trending zone. This deposit appears to be closer to the style of the SOB Succession, with carbonaceous argillites and chalcopyrite mineralisation, rather than the higher grade more carbonatic bornite-chalcopyrite ore characteristic of the Mindola Succession. In addition, between Chambishi Southeast and Mindola there is a further small resource known as Ichimpe (3.1 Mt @ 1.8% Cu). The gap between Chambishi Southeast and Ichimpe appears to be less than 1 km, while an interval of nearly 2 km known as the Ichimpe Barren Gap, corresponding to a basement ridge, separates it from Mindola. On the Western Limb of the Nkana Syncline a drill indicated resource is estimated by Freeman (1988), comprising a higher grade zone of 46 Mt @ 2.37% Cu and a lower grade 61 Mt @ 1.99% Cu. Primary mineralisation is chalcopyrite, pyrite and carrollite. Of these two blocks, the one with the higher grade, is further to the SE (closer to the interpreted shore line to the NE) over a 7 km strike length, while the lower grade is more to the NW (or further to the SW of the interpreted shore line), confirming the overall decrease in ore grade from NE to SW in the Copperbelt Orebody Member. 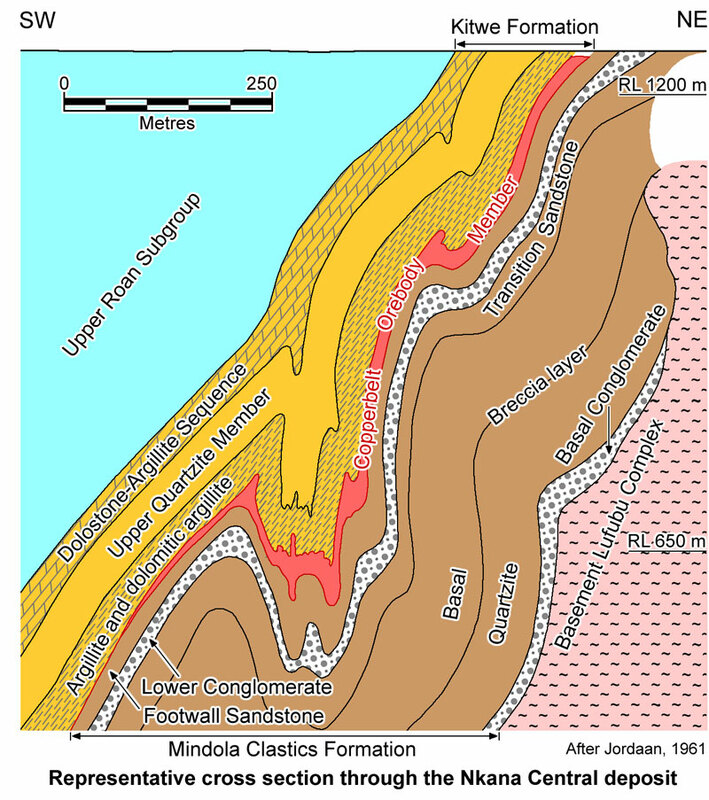 In these two zones there are basement hills with steep relief, extending in places to the base of the Copperbelt Orebody Member, with a Mindola Clastics Formation of conglomerates, grits and quartzites. The Copperbelt Orebody Member is banded sericitic argillite and carbonaceous shale, while the Hangingwall Formation is composed of argillites, quartzites and dolostones. Over basement hills dolomitic facies of the argillaceous rocks are developed, while the hills as on the eastern limb influence complex anticlinal drag folds. Mineralisation was found within the Copperbelt Orebody Member, uppermost Mindola Clastics Formation arenites and occasionally within the Hangingwall Formation argillites. No ore was seen in the Chibuluma Footwall Ore Body position. In general then it appears that in the Nkana area, the orebodies are found adjacent to basement highs and the palaeo-shoreline of the Copperbelt Orebody Member, where the underlying Mindola Clastics Formation arenites thin. Ore does not occur directly over basement highs, nor does it persist into the carbonaceous argillites facies into which the Copperbelt Orebody Member grades in the main basin. However if basement hills occur below these basinal carbonaceous argillites, ore may again be present on their flanks. The best, highest grade, bornite rich ore is along the basin margin where the Copperbelt Orebody Member laps onto the Kafue Anticline, the biggest of the basement hills. Enrichment on the crests and troughs of folds is common. Mineralisation is also present below the Copperbelt Orebody Member in the Footwall Sandstone in places, particularly in the South Ore Body. The Footwall Ore Body at the Nkana SOB mine occurs some 30 m below the main Copperbelt Orebody Member. It was situated within a small depression, lapping onto basement on its margins, but being separated from it in the central sections. This palaeo-basin was subsequently deformed into a tight syncline. Where the orebody is in contact with the basement, the Lufubu schists are also mineralised with disseminations and veinlets extending as much as 8 m into the schists. Elsewhere in the Nkana SOB mine, sections of the Footwall Sandstone are commonly rich in anhydrite (with up to 70% in places), grading into a very dolomitic rock with associated tremolite. For short distances, these tremolitic dolomitic rocks carry strong Cu-Co mineralisation with accompanying high soda (albite) feldspar and micas. Secondary mineralisation is important in the upper levels and open pit, particularly in the Porous sandstone at the northern end of Mindola and locally at the south end of the South Ore Body. The principal ore minerals are malachite, pseudomalachite, chrysocolla, native copper, cuprite and libethenite. Locally, cupriferous vermiculite, malachite, pseudomalachite and accessory wad are important. A traverse across an outcrop of the South Ore Body within the South Orebody Shale, from a location where clearing had stripped a metre or less from the natural surface, may be described as follows. From east to west the traverse commenced with basement gneiss overlain by 20 m of semi continuous outcrop of weathered and decomposed, foliated, arkosic sandstone, with occasional coarse cubic casts after pyrite. Within this interval there were one to two discontinuously developed, thin, 1 to 2 mm bands of poor malachite staining over lengths of 1 to 2 m. Sections of this arenite had red to brown diffuse limonite staining. Following this there were 7 m of dark, finely banded resistant shale with traces of malachite and slightly ferruginous faces, some white decrepitated patches, and minor white carbonate veinlets/fracture coatings. Irregular bands of brown mica were developed, possibly cupriferous vermiculite, with associated malachite colouration. Some 50 m to the SE on the face of an old open pit, rocks which 20 to 30 m lower are strongly malachite stained, occur at the surface above the pit as well banded dark shales with intermittent, 1 to 10 mm thick, brown iron stained bands, not unlike a weathered sparsely pyritic black shale. Both of these outcrops are apparently weathered ore grade Copperbelt Orebody Member of the South Ore Body, which occurs in both the upper sections of the Mindola Clastics Formation arenites, and the Copperbelt Orebody Member black shale (Porter, 1992, visit notes). Lithologies and ore types of the Copperbelt Orebody Member at Mindola, Zambia - The bulk of the ore in the Nkana Central-Mindola mine area is hosted by the Copperbelt Orebody Member, which is immediately underlain by a 0 to 4 m thick, massive cobble to pebble Footwall Conglomerate at the top of the Footwall Quartzite unit, both of which are not significantly sheared. 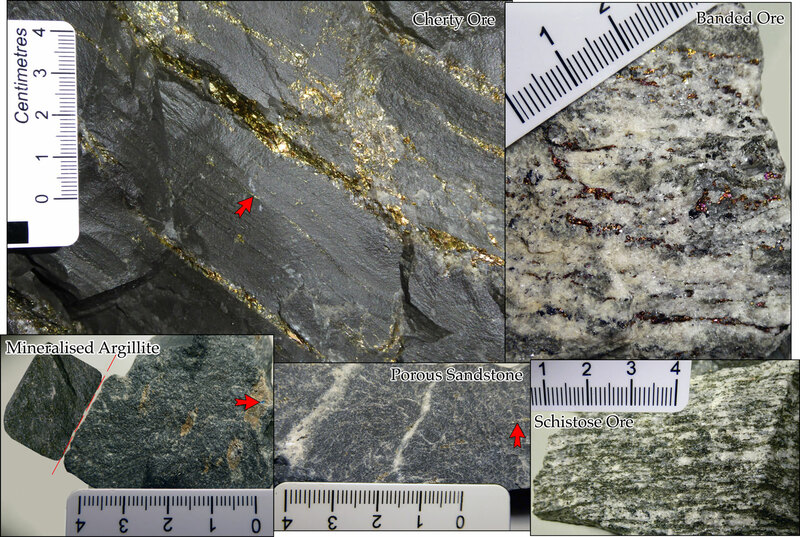 The base of the Copperbelt Orebody Member is marked by a relatively sharp planar contact with the ~2 m thick, variably mineralised, sheared Schistose 'Ore' (lower right image) composed of micas, dolomite and anhydrite. The speciment above is not well mineralised. This is in turn followed by 1.5 to 2 m of Low-grade Argillite, or siltstone, (similar in appearance and composition to the Mineralised Argillite near the top of the ore zone - bottom left). The next unit is the 2 to 4 m thick schistose Banded Ore (upper right), composed of alternating thin interbeds of white dolomite and sheared grey argillite with bands and branching veins of chalcopyrite and bornite. The Banded Ore is followed by 1 to 4 m of Cherty Ore (upper left), a hard, silicified, massive to bedded, non-schistose grey argillite with sparse white dolomite laminae, conformable, bedding controlled disseminations (arrow head), veinlets and veins of copper sulphides, as well as crosscutting sulphide and quartz-sulphide veins and veinlets. This is capped by the 0.5 m thick No. 1 Marker, similar in appearance to the Schistose Ore and Banded Ore layers. The Porous Sandstone (lower-middle), which is 0 to 4 m thick, and varies from a massive, khaki, siliceous, dolostone, through a dolomite-anhydrite rock, to a massive algal dolostone with stromatolites, with disseminations and thin veinlets (arrow head) of bornite and chalcopyrite. While not a sandstone where fresh, its name derives from its surface, weathered expression, where the carbonate components have been removed, leaving a residual, friable, porous sandstone. This carbonate rich unit grades upward through a 0 to 3 m thick transition to the 0 to 2 m thick Mineralised Argillite (lower left), a massive dolomitic siltstone with local dolomite streaks and nodules (beige lenses in image) with associated bornite (e.g., arrow head). The surface on the main part of this image is parallel to fissility, while that section to the left of the red line is perpendicular to fissility. The Mineralised Argillite then grades upwards into the 5 to 10 m thick Hangingwall Argillite, which is seldom mineralised and marks the top of the Copperbelt Orebody Member. It comprises a grey dolomitic argillite or siltstone, locally rich in dolomite spots and anhydrite blebs, which coarsen upwards towards the overlying Hangingwall Quartzite. The Cherty Ore was photograped in situ during a visit in 2014, while the other specimens were collected by Mike Porter during earlier visits in 1992 and 2001. Photographs by Mike Porter. 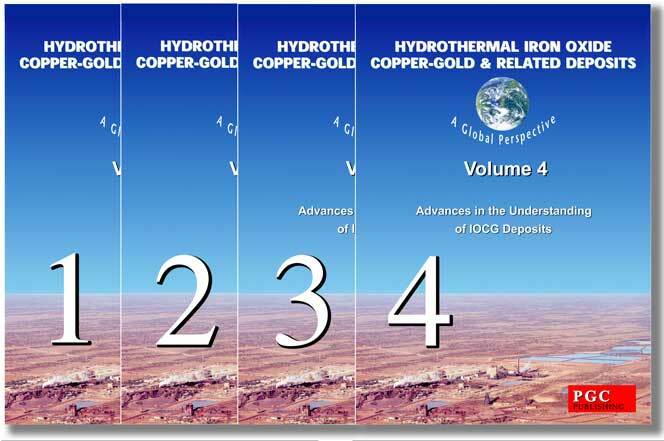 inferred resources - 1.10 Mt @ 1.26% Cu (total), 0.86% Cu (acid soluble), 0.07% Co. The mine is operated by Mopani Copper Mines plc (see Mufulira for ownership details).